On March 16, 1853 The New York Times reported that the Board of Aldermen had received a request from the managers of St. Luke’s Hospital, “asking permission to sell the lots conveyed to them by the Corporation two years since” and using the proceeds to purchase a larger lot uptown. The plot in which the hospital was interested, indeed, further uptown. The hospital was incorporated on April 25, 1850, and now planned its modern, expansive facility. It purchased the entire block of West 54th Street from Fifth to Sixth Avenues. The location was chosen not only for the inexpensive real estate, but because the remote, high location provided an abundance of sunshine and fresh air. The area was almost entirely undeveloped. 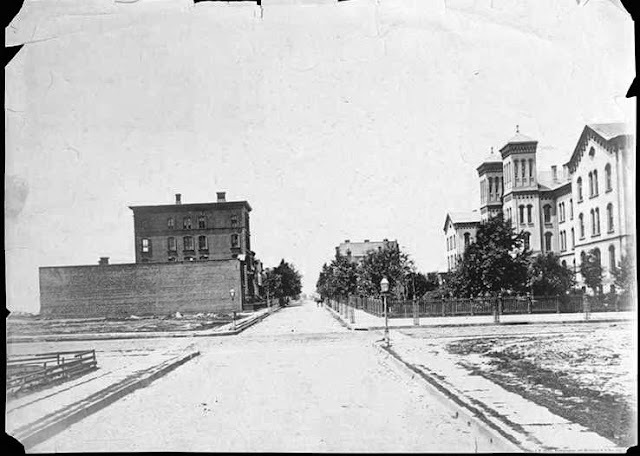 Three blocks to the south was the large Catholic Orphan Asylum and at 44th Street was the Colored Orphan Asylum. Otherwise, the rutty dirt road known as Fifth Avenue was essentially barren above the Croton Reservoir at 42nd Street. The cornerstone of what The New York Times anticipated would be “a splendid and spacious edifice” was laid on Saturday, May 6, 1854. A crowd of around 300 had traveled to the site on an unusually cold spring day. The officials of the hospital assured the assemblage that funds would not be wasted on frivolities. That architect was Jonathan (known as John) W. Ritch, of the firm Ritch & Griffiths. His three-story Italianate design smacked of the institutional buildings being designed by James Renwick, Jr. for the city on Blackwell’s Island. The central section was dominated by the chapel, which was flanked by two four-story towers. Expansive wards branched off to either side—the western ward for men, the eastern for women. At the time of the cornerstone laying the cost of the completed structure, including furnishings, was estimated to be $150,000—about $4.4 million in 2015. Because only half of that amount had been raised, the hospital would be constructed in sections. “They will therefore proceed with the erection of two-thirds of the building as planned, in the confidence that when that much is done they will have the means of completed the whole,” said The Times. By the time half of the building was completed and the chapel opened on June 22, 1857, the cost had risen to $200,000. Half of that amount had been raised. 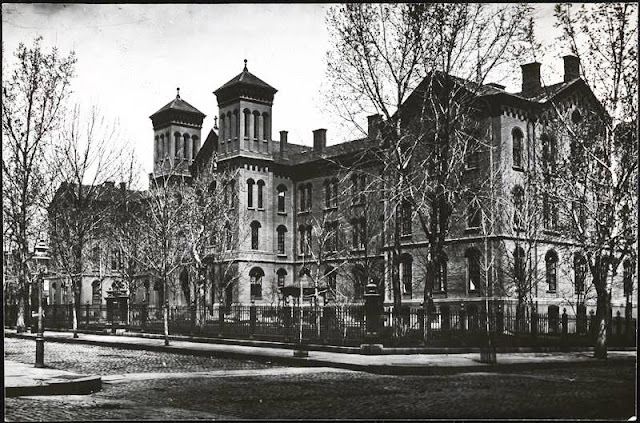 Less than a year after the chapel opened, the hospital was completed and on May 13, 1858 it opened its doors to patients. Although St. Luke’s was affiliated with the Episcopal Church, its 200 beds were available to all creeds. Its charitable approach to medical care was evidenced by the cost of a private room. Patients who preferred not to stay in a common ward paid $3.05 per week; yet the cost to the institution was $4.65. The hospital filled not only with the sick, but with victims of a variety of sometimes bizarre accidents. Lyke Flynn was a laborer, working in the creation of Central Park, when he was struck “by a large stone which fell upon him from a derrick,” reported The New York Times on October 22, 1858. He did not survive. Another laborer, 60-year old William Simmons, “was precipitated from a scaffold at a house in Fifty-fifth-street” where he was working on February 7, 1860. He, too, died of his injuries. And Mary Brown, a servant of a family on East 83rd Street, was standing in the yard of that house in October that year as construction workers blasted for the foundation of a building across the street. A stone flew into the air, crashing down on Mary’s head. One of those soldiers in 1862 was Corporal James Marchall, the color bearer of the 2nd New Jersey Regiment who was injured in the battle of Gaines’ Mill. Refusing to allow the flag to be taken by the enemy, he buried it where he knew he could go back and retrieve it. He was taken prisoner shortly afterward, with his thumb shot off. After being imprisoned in Richmond for some time he was released and ended up in St. Luke’s. A different type of war victim would be brought here the following year when the bloody Draft Riots erupted on the streets of New York. Eighteen-year old Francis McCade did not survive the gunshot he received on the corner of 36th Street and Ninth Avenue on July 14, 1863, for instance. One policeman after another was brought in after being assaulted by the mob. Officer Bennett was knocked down three times before he stopped fighting. Unconscious, he was robbed of everything “save his drawers” according to newspapers. The mob left him for dead and he was taken to the Dead House. When his wife visited his body several hours later, she realized he had a heartbeat. He was brought to St. Luke’s. A score of other police officers were brought in; including Officer Didway who was beaten so badly that his eye was forced out of the socket. 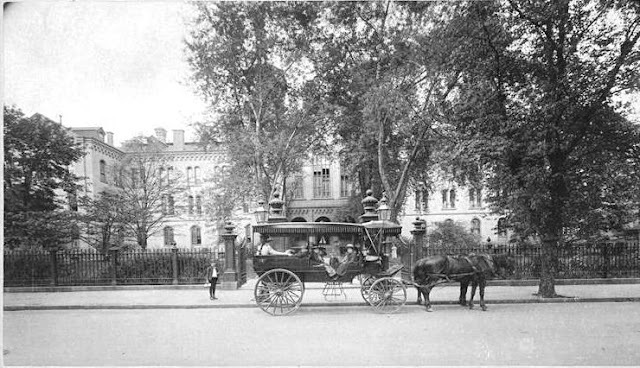 Things returned to normal after the end of the war and physicians at St. Luke’s Hospital returned to treating ill and injured citizens. On the afternoon of September 9, 1867 Robert Goliver attempted to jump off the front platform of a moving Sixth Avenue street car. He fell under the car and a wheel passed over his foot, cutting it badly. Two weeks later John McDonough fell from the third floor of a newly-constructed building at 54th Street and Third Avenue. He fractured his skull and sustained other injuries. The hospital served 1,027 patients in 1868, 172 of which were children. Patients who could afford to paid $7 a week while here, including all necessary medication and treatment (an enviable fee of about $120 in 2015 dollars). Children paid $4. Muhlenberg’s assistant pastor at the time was a Southerner, Fleming James. He was in Baltimore in 1869 visiting a clergyman when, according to James, “he was suddenly called upon to read the burial service” of John Wilkes Booth. For the past four years the assassin’s body had been moved from place to place for various identifications; and finally had been released to his family for burial. James explained in July “As he was just going out of town, he requested me to do it for him. I consented, having but a few moments for reflection, and seeing no good reason for refusing.” Fleming James officiated at the burial of America’s most hated citizen. Reaction from the press and the community in general was scathing. The room was unlit except for the 100 candles on the Christmas tree. “The kind visitors passed from couch to couch, speaking words of comfort to the little sufferers, and wishing them a merry Christmas.” The group sang a few hymns. “When these were concluded, the tree was stripped of its rich treasures, and each child was presented with several nice presents,” said the newspaper. On the night of April 8, 1877 Dr. William Augustus Muhlenberg died at the age of 80. The Times said “Now that he is gone, people will begin to realize the gap which his absence makes in a large community busy with its own affairs.” His funeral was held in the chapel of St. Luke’s Hospital on the afternoon of April 11. 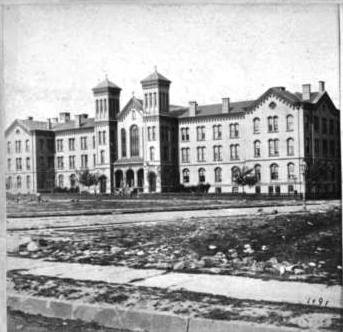 When local doctors could not help her, she was brought to St. Luke’s on December 1, 1874. It was the beginning of a complicated procedure of skin grafts to replace her scalp. Dr. Weir applied ointments designed to aid production of new tissue for 27 days. Then “little pieces of thin skin, not larger than a millet-seed, were carefully taken from the arm of a healthy man, and 25 of these were grafted on the head of Lucy.” Some of the tiny grafts grew; most were rejected. But the doctor persistently pushed on. There was interest in the property, but no one seemed willing to purchase the entire plot. The exclusive Union Club negotiated for the Fifth Avenue corner and it seemed for awhile that the hospital officials would sell that plot. Then on June 3, 1893 The Record & Guide reported that Charles A. Seymour & Co had purchased the entire property for $2.4 million. The firm had already negotiated the sale of certain parcels. 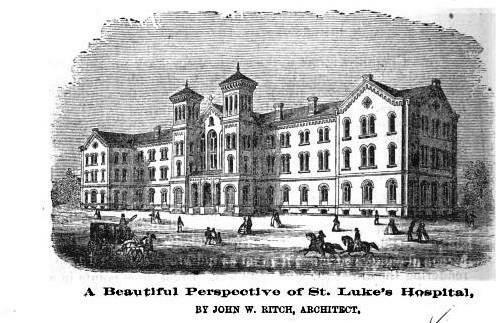 St. Luke’s Hospital relocated to 113th Street between Amsterdam Avenue and Morningside Drive in 1896. 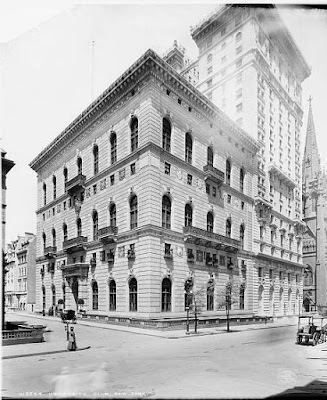 The old structure was demolished and one by one lavish homes rose on the block, anchored by McKim, Mead & White’s grand University Club on the Fifth Avenue corner, completed in 1899. The University Club sits at the corner of Fifth Avenue, while down the block newly constructed mansions can be seen. from the collection of the Library of Congress. Remarkable, as I worked on 54th & 5th, across from the University Club, for six-and-a-half years.